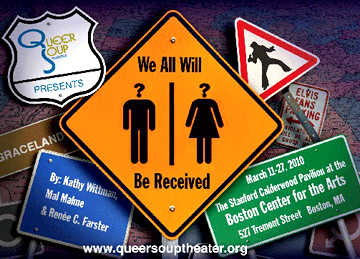 Queer Soup Theater Presents "We All Will Be Received"
"We All Will Be Received"
Queer Soup Theater will premiere their newest show "We All Will Be Received," written by Kathy Wittman, Mal Malme and Renée C. Farster, from March 11 - 27 at the Calderwood Pavilion at the Boston Center for the Arts. Directed by Kathy Wittman, this world-premiere, multi-media production travels the line between theater and film, with detours to Elvis' Graceland and Dolly Parton's Dollywood. In "We All Will Be Received," a documentary about two drag kings on a road trip to study gender icons takes a personal turn when the filmmaker and her subjects hit their own gender road blocks. Director Kathy Wittman commented, "When Renee and Mal first told me they wanted to take their drag kings on a pilgrimage to Graceland, I immediately started begging to tag along. What better backdrop to examine gender roles in a changing world, than a road trip to pay homage to the patron saint of drag kings?" She adds, "Our play is an expedition backwards into the place where our assumptions and presumptions about gender came from, and forwards towards a place where gender ambiguity is not dangerous, and where the lines between masculine and feminine are blurred. A world where you are judged not as a 'girl' or a 'grrrl' or a 'boy' or a 'boi'... but as a person. A world where we all will be received." Mal Malme, performer and co-creator commented, "For me, 'We All Will Be Received,' is an opportunity to broaden the discussion of gender and to allow for those of us who don't fit neatly into the societal definition of what it is to be female and male, to have a voice and to feel empowered and encouraged to express our gender however we feel works for us. This show is about validation, not just for us as the performers, but for those who are and those who want to be part of the dialogue. I hope it's a show that inspires folks to be who they are, without apology." Queer Soup will present a Benefit Performance of "We All Will Be Received" on Thursday, March 18, at 7:30 p.m. for the Massachusetts Transgender Political Coalition, which is dedicated to ending discrimination on the basis of gender identity and gender expression. Founded in 2001, MTPC is the only statewide organization whose priority is advocating for the needs of the transgender community, this includes working on a campaign to pass a statewide gender identity and gender expression non-discrimination and hate crimes bill.